Type of Gestation: Triplet Monochorionic/Triamniotic Pregnancy. A thick membrane was seen separating baby A, baby B, and baby C.
Baby A is located in the lower, midline part of the uterus. 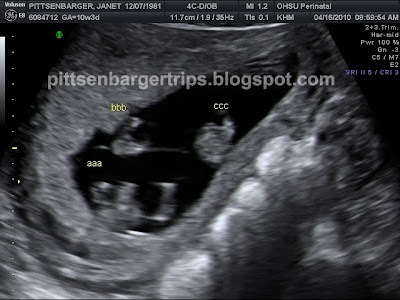 Baby A's placental location: Anterior. Baby B is located in the right, superior part of the uterus. Baby C is located in the left, superior part of the uterus. Uterus and adnexae: No abnormalities seen. There is fetal heart motion for each fetus. 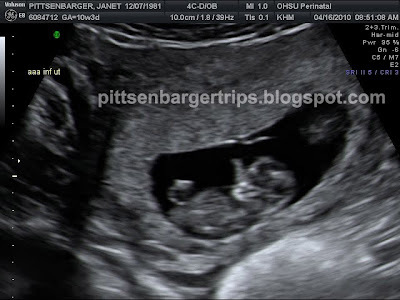 Ultrasound cannot detect all fetal/preganancy abnormalities. 1. Nuchal translucency measurements at 11-13 weeks. 2. Growth and cervical length ultrasound at 16 weeks gestation. 3. Fetal anatomic survey at 20 weeks gestation. She has an appointment with Dr. Clock in clinic today. Thank you very much for allowing us to help care for your patient. Diet, don't try this at home!